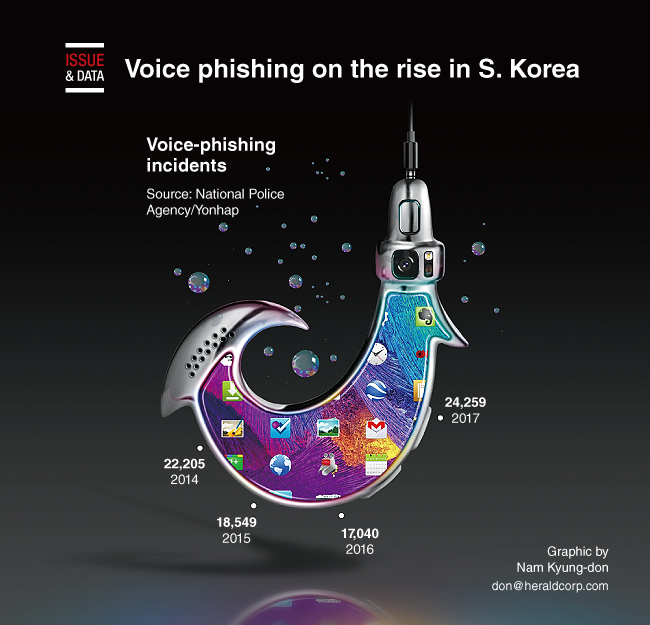 South Korea reported 98,391 voice-phishing incidents between 2014 and June of this year, according to data submitted to Rep. Lee Jae-jung by the National Police Agency. The number of voice-phishing incidents, which had dwindled to 18,549 in 2015 and 17,040 in 2016 from 22,205 in 2014, soared to 24,259 last year. In the January-June period of this year, victims throughout the country reported 16,338 such incidents and 179.60 billion won in resulting damages - on-year increases of 53.7 percent and 70.8 percent, respectively. More than 72 percent of the voice-phishing incidents involved fraudulent emergency loan transactions. In such cases, criminals typically contact bank-account holders by telephone and talk them into transferring money to another account.